First: I hate walking through stores. I am not naive enough to know why they place bread and milk on the opposite sides of grocery stores or why they always have batteries at the cash registers. Its all part of their plan to have you buy more useless junk because in America we have the attention span of a 5 year old. With that said, I was walking through a store last week (lets just call it Mal-Wart) and there was a mom holding back a screaming because they went past the toy aisle and the kid just kept screaming "LEGO! LEGO!" because the mother had mistakenly walked down the aisle with lots of Lego sets in it. I'm sure there was once a point in time where we were all screaming "LEGO!" at the top of our lungs. I know I probably did. The first set of LEGO's I got as a kid was when I was about 3 years old (my parents were rule breakers, because I wasn't 4 like the box suggested) and it came in the common "Blue Box" that the basic LEGO sets come in today. It was simple: two people, an assortment of 5 differently colored bricks, in various sizes and then one of their small build panels. Like most kids of the time I started to play and then I was hooked. I would spend countless hours building, destroying, rebuilding, destroying... Then as time when on I was able to accrue more pieces: Like the Technix kits and other simple LEGO kits. Eventually my play pail was full of various LEGO pieces and parts. But you can't mention LEGOS without talking about LEGOland. The first park opened in 1968 and since LEGOland's have opened up across the world. The big one here in the US is the one out in Los Angeles. While I have never been, it is on a list of future stops (thats for damn sure...) I have been to other smaller LEGO outlets though like the ones in Chicago and Orlando. If you're like me then you also remember the excitement when your younger cousins (or even children) open up that box of LEGOS at Christmas or on a Birthday and you think to yourself: "I could get that together in about an hour..." then you sit there in awkward silence because you're afraid that your girlfriend or wife just heard you meant to think internally, but instead announced it to everyone in the room. Its as if playing with LEGOS is a shameful kid activity. But there are many people that have made it cool to play with LEGOS as adults and even have jobs where they do nothing but play with LEGOS all day. They have LEGO jobs at their corporate offices (where some of the people even get to design new sets all day!) and there is even something called "LEGO Serious Play" which is a corporate team building event that strives for executives and employees to collaborate using LEGOS. 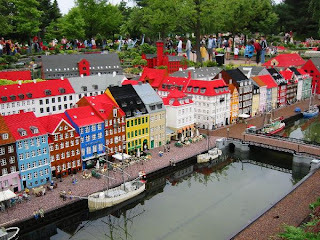 There are also the LEGO model builders who have built replicas of buildings through out the world. 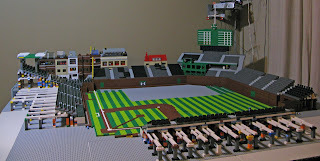 Since this is also a Cubs Blog you can't help but wonder: is there a guy out there that is building a LEGO version of Wrigley Field? Well, yes there is. 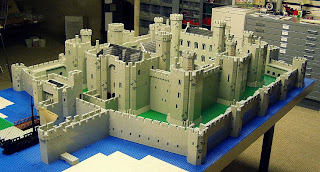 It is still under construction, but mind you these masterpieces of plastic brick take a while to build.